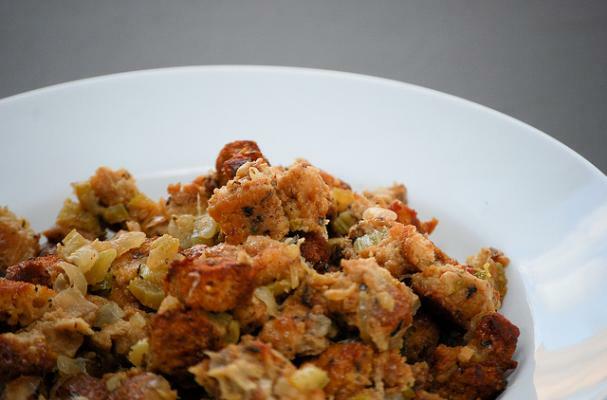 Are you ready to disover the secret behind the best ever gluten free stuffing? Are you sure? Okay... The key to having the best possible gluten free stuffing is your bread element. Over the years, we've tried cornbread, Udi's, Rudi's and 50 other brands, homemade bread, rice, kasha, the works -- and yet, I keep coming back to this one Thanksgiving with a stuffing recipe to die for. Crispy on the outside, soft and tender in the middle, this stuffing is perfect for baking with or without your Thanksgiving turkey! Okay but seriously, the secret? Use Van's Frozen Gluten Free Waffles instead of regular toast or croutons and you're good to go. Click here to see the Best Gluten Free Stuffing Recipe - using Van's Waffles!